This unfinished and uninscribed boundary stone (kudurru) is a symbol of the cosmos as conceived by the Kassites: a giant, two-homed snake (symbolizing the river of the underworld) encircles the foundations of an earthly palace, the towers and battlements of which rise upon its back; above them, a procession of minor deities play instruments and are accompanied by wild beasts; the next tier, marked by the emblems of the supreme deities, is heaven; and, finally, crowning the monument, is a second serpent (the celestial ocean) which coils protectively around the recumbent Bull of Heaven. Unfinished boundary stone (kudurru) divided into three registers. 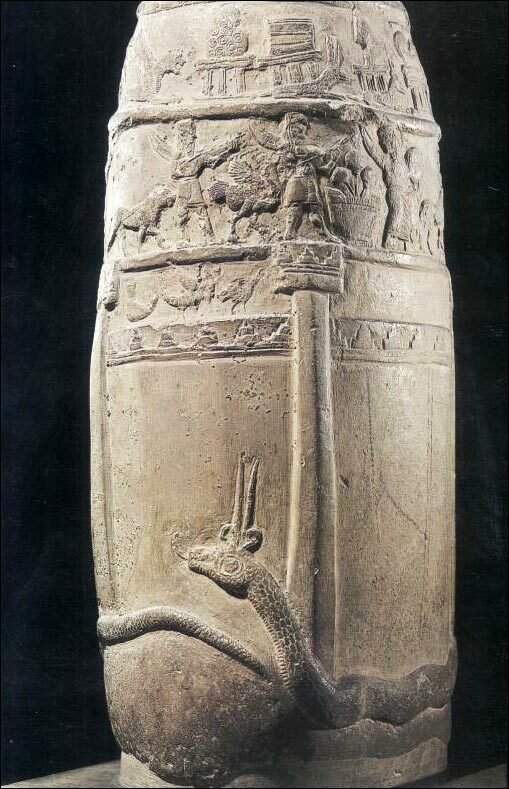 Bottom register encircled at its base by horned serpent from whose back rises a fortified citadel or palace consisting of plain columns with crenellated capitals and horizontal crenellated battlements; above battlements, three divine emblems: the lamp of the god Nusku; a composite creature with a male head, scorpion's body, wings, and two lion's feet, symbol of an as-yet-unidentified god; and the strutting bird of the god Papsukkal. Central register: a divine procession consisting of seven males (two visible in image) wearing short skirts, horned crowns, carrying quivers containing bows and arrows, and playing long-necked lutes, each leading an animal (visible are, from left, a spotted feline, an ostrich, and the rear part of a horned caprid; not visible are another horned caprid, a deer, and a lion); procession, marching toward a symbol resembling a large tub containing three club-shaped blossoms, ends with one female figure, also with a quiver and horned crown, but wearing a long garment and playing a drum. Top register, symbols of the supreme gods (visible are a reclining lion dragon of uncertain symbolism, an altar-shaped "seat" or throne supporting a female bust (symbol of the goddess Gula); two recumbent horned composite creatures, each supporting a throne, one surmounted by a rectangular object (symbol of the god Nabu), and the other by a triangular spade (marru, symbol of the god Marduk); not visible are symbols of Ninhursag, Ea, Anu, Enlil, Sin, Shamash, Ishtar, Nergal, Zababa, Harba(? ), and Ninurta(? ); all surmounted by a second coiled serpent encircling the figure of a recumbent bull (now largely effaced). A. When completed, this kudurru would have been erected to publicize the granting of a piece of land by a king or high official to a particular person or a temple. The representations of the divinities of the Kassite pantheon and the structure of the cosmos that decorate its surface placed that grant under the protection of all the gods--anyone damaging or altering the text, or failing to adhere to its dictates, would incur the wrath of the entire cosmos. B. This kudurru is a fairly literal depiction of the hierarchical structure of the cosmos as conceived by the Kassites and of the attributes of the gods and goddesses that occupy its various tiers. The large horned serpent encircling the base of the monument symbolizes the gods of the underworld, the land of death, but also the source of the underground waters which nourish all life. The palace, rising from the serpent's back, represents earth--the abode of the king; its fortified walls would have carried the text of his decree in the carefully prepared boxes visible on the right-hand portion of the image. Above the palace is the realm of the gods, arranged in three tiers. The three lowest deities occupy a space just above the palace battlements, but below the tops of its columns, and thus seem t o be ranked just slightly above the king himself. They are probably all figures who sometimes intercede for man with the gods: Nusku, god of light and fire, and also exorcist of hexes and spells, is symbolized by a lamp; Papsukkal, messenger of the gods, is symbolized by a strutting bird; and an unknown deity is represented by a composite creature with human head, scorpion body, and lion's legs. The second tier is the abode of the gods and goddesses of wild animals and of the hunt, identified by the beasts that accompany them and by the quivers with bows and arrows on their backs. These deities, whose names we do not know, are beneficial to man as the producers of game and, also, as the controllers of the behavior of wild animals, whom they charm with their music. Above them, in the uppermost register of the kudurru, are the symbols of the great gods and goddesses of heaven, who control the working of the cosmos, carefully arranged in descending rank from right to left. Present, but not visible in the image, are; the rayed sun disk of Shamash; the crescent moon of Sin; the star of the great mother and warrior Ishtar; the horned crowns of Anu and Enlil, powers in the sky, resting on throne-shaped bases; the composite goat-fish and ram stave (on a throne-shaped base) of Ea, the god of the sweet waters; and the symbols of Ninhusag, goddess of birth--a cow's uterus and knife, again on a base. Visible are: two mushhush dragons guarding bases supporting the spade of Marduk, city god of Babylon, and the tablet and stylus(?) of his son, Nabu, god of scribes; a base supporting the bust of Gula, goddess of healing; and a reclining lion demon that may represent Ninurta, god of the thunderstorms and spring floods. After them (not visible) are: the lion stave of Nergal, Lord of the Underworld; a bird with head turned back, probably representing an enigmatic Kassite god named Harba; the eagle stave of Zababa, city god of Kish; and a reclining winged lion. The monument is crowned by a second coiled serpent, representing the celestial ocean that is the counterpart of the river of the underworld, encircling the badly damaged recumbent figure of the Bull of Heaven. C. The production of elaborately decorated and inscribed kudurrus, publicizing grants of land by the king and other high officials, reached its height during the Kassite period. (For a detailed discussion, see 2Bi.002.) The object pictured here is an example of the form that such monuments took during the twelfth century--an elongated rectangular block carved in the form of a fortified palace protected by towers and battlements. The prominence of the two serpents on this particular Kudurru is unusual, but is in keeping with the importance of serpents in the symbolic imagery of ancient Mesopotamia (see, for example, Star No.400, 520; 2Bb.517, 2Bc.024, 2Bd.077, 2Bf.007). E. Moortgat (p.101) notes that the picture-language of the Kudurru reliefs is fundamentally an attempt in iconographic form to crystallize the theological speculation of the polytheistic pantheon of the second millennium B.C. Symbols were chosen to indicate the complex character of the gods they represented and attempts were made to explain their hierarchic position in the theological system and their bearing upon thee various spheres of the cosmos. This kudurru, although unfinished, is considered by many to be the finest known example of Kassite relief in both subject matter and style. Its representation of the structure of the cosmos is developed in particular detail using the entire surface of the block, rather than one or two faces, and is unusual in limiting the inscription (unfortunately never completed) to the register representing the earthly palace. The presence of two serpents, symbolizing the celestial ocean and the river of the underworld, provides a unique visual and conceptual frame for the entire composition, and the inclusion of the register containing gods and goddesses of wild beasts and the hunt is unique. Haussig, Hans Wilhelm, Götter und Mythen im Vodereren Orient (Stuttgart, 1965). Jacobsen, Thorkild, The Treasures of Darkness (New Haven and London, 1976). Moortgat, Anton, The Art of Ancient Mesopotamia (London and New York, 1969), pp. 100-103, pl. 231-232.